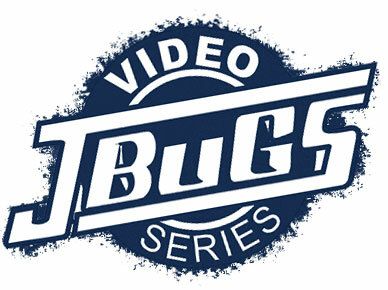 In these next set of videos we will be focusing on the front end of a 1963 VW Beetle. Follow along as we walk you through how to remove the front link pin beam. This is the first step to lowering, narrowing and adding stopping power to the front end. Hi Sam here with JBugs.com. In this next set of videos of our 1963 resto custom Beetle, we're going to be lowering, narrowing, and adding some stopping power to the front end. We're going to install a two inch narrowed adjustable front beam, disc brakes and drop spindles. That all starts by getting the original front end off so follow along with us as we pull off the complete front end in this video. The rear wheels are chocked, and the front lug bolts on both sides are loosened. The front end is jacked up, and the front of the pan is set on jack stands. We aren't setting the stands underneath the beam as we will be removing the beam shortly. The car is lowered onto the stands, and then the front wheels are removed from the drums. On the driver's side the speedometer cable cir-clip is pulled off the grease cap, and the grease cap was removed so we can access the spindle nuts. The spindle nuts are reversed threaded on the driver's side and loosened accordingly. The brake drum is pulled off the spindle complete with the bearings and seal. The front left brake hose is cut as we will be replacing all the brake hoses later. The backing plate is unbolted from the spindle, so that we can remove the backing plate as a complete assembly with the brake shoes and wheel cylinders intact. The speedometer cable is pulled from the spindle and tucked away on the inner fender well. Next, the left tie rod is removed from the spindle, then the inner left tie rod end is removed from the pitman arm. We follow that with the inner right tie rod end as it is easily accessible. Now the link pins can be loosened from the control arm by removing the two lock bolts. One on the upper control arm and one on the lower control arm. With both lock bolts removed, the spindle and carrier are removed from the control arm, with the assistance of a hammer, to push the link pins through the arms and to tap the assembly free. Our 1963 Beetle doesn't currently have a fuel tank so our next steps are much easier. If your car does have a fuel tank in place, it will need to be removed to access the steering damper, the steering coupler and the upper beam to body bolts. The steering damper is unbolted from the beam, and the steering coupler in unbolted from the steering column. The cotter pins in our bolts were stubborn to we ended up removing the clap bolt for the column and then removed the column from the splined end. The two upper bolts from the body to the beam, the spindle nuts on the right side are standard right hand thread. The right side wheel, drum, backing plate, and spindle assembly are removed from the beam following the same steps used for the left side. Typically the beam could be removed from the car as a fairly complete unit at this point, by removing the four beam to chassis bolts. In our car we had to continue the tear down further as too long of a shock bolt had been used at some point on the upper left shock. The bolt had actually pushed through the inner fender well and made removing the beam as a complete unit more difficult. The stock sway bar clamps are removed from the trailing arms by bending back the fold over tab on the clamp plate and tapping the clamp plate off the clamp. Then the clamp can be pried off the trailing arm. This is done at all four clamps and then the sway bar is removed. The right shock absorber bolt is unbolted from the shock tower and the lower control arm and then removed. After we've chiseled through the caked on grease, we loosen the set nuts on the grub screws from the upper and lower control arms. The grub screws are un-threaded from the trailing arms. The trailing arms are removed from the beam. For the upper control arms it's easier to pull up on the arm slightly and remove the suspension stop. A hammer can be used to move the upper control arm past the suspension stop where it can then be pulled out of the beam. The same steps are taken for both sides but in our case as we've mentioned the upper shock bolt on the left side was too long and could not be removed so it was left in the beam. Now that all four trailing arms are removed, we can remove the four beam to chassis bolts and because the left shock bolt [is] poking through the body, we have to pry and tug the beam from the body. Normally the beam would be much easier to remove nearly falling out once the beam to chassis bolts are removed so be ready and maybe have a few friends to help lower the beam to the ground. With the beam out of the car we can remove the troublesome shock bolt which was a poor fix for a stripped out shock tower. Now the steering box can be unbolted from the beam and our disassembly is complete. We will be saving the front spindle carriers, trailing arms and the steering box. We will also save all of the hardware and lock plates. Some will be reused; some will be replaced, either way save the hardware you're removing until the projects complete. You never know when an original bolt or lock plate may come in handy. Everything will be cleaned and the steering box and arms will be painted and used in our next video. Stay tuned, thanks for watching and stop by JBugs.com the next time you need front suspension parts or any other parts for your vintage VW.